In surface, mount Assembly Solder Paste Printing is the most critical process for product quality perspective. Solder Paste printing process is the common way of applying solder paste onto a PCB, which is performed by printing solder paste through apertures in a stencil. It is very Important of surface mount Assembly process and also known as screen Printing. The reason for applying solder paste is to be able to receive electrical and mechanical connection of components to the PCB after component assembly and reflow soldering. A solder paste is a form of solder that used in PCB assembly to make conductive joints. Solder paste is essentially metal powder suspended in a thick medium called flux. The solder pastes normally contain 88-92% metal by weight. Paste Powder Sizes: The normal particle size in solder paste is 20 to 38 μm (type 4). For 0.3 mm pitch CSPs and 01005 chip components, 10 to 25 μm (type 5) solder paste should be used. The choice of particle size is a compromise between printability and oxide contents in the solder paste. The finer the particles are, the easier it is to get an accurate print. With a finer solder paste, the oxide content increases due to the increased total particle surface. This gives the solder paste bad wetting properties and increases the risk of solder balls. Viscosity: The viscosity of a solder paste depends on the contents of solid mass in the flux, the metal contents and the size and shape of the solder particles. The ambient temperature. Low temperatures make the solder paste viscous and difficult to apply. Too high temperatures may make the solder paste spread on the board surface and cause solder balls. There are some recommended Viscosity Criteria based on application methods like Syringe Dispensing (200-400 kcps), Mesh Screen Printing (400-600 kcps ) and Stencil Printing (400-1200 kcps ). Handling and Storing: Solder paste is stored refrigerators with temperatures between +4 °C and +8 °C. For more precise information please check the solder paste specification from the manufacturer’s data sheet. Solder paste should be refrigerated when it is not being used. Solder paste can only be reused if it has been out on the stencil for less than one hour. It should never be reused twice. Solder paste should be thawed out for at least 2 hours before using. Do not remove worked paste from the stencil and mix with unused paste in a jar, this will alter rheology of unused paste. When refilling the screen printer, you must stir or knead the solder paste in a suitable way. For this few automatic machine options are available for better results we can adopt them. One of the most important parameters in the screen printing process is the choice of the squeegee, and the settings related to the squeegee. The following recommendations should be followed for good printing results down to 0.4 mm pitch solder paste printing. Squeegee type: There are three types of squeegee geometries: D-cut, diamond, and trailing edge. The most common of these is the flat metal squeegee. The diamond-shaped squeegee gives a 45-degree angle to the stencil. Types of materials: Mainly Squeegees are made of polyurethane or metal. Polyurethane Squeegees varies paste deposit by initiating scooping less expensive than Metal and may be necessary. if using a Step-Down Stencil Polyurethane Squeegee 90 or Higher Durometer recommended for fine pitch. Metal Squeegees Lasts longer than Poly Blades, Can be Fragile and most popular. It helps to Reduces the effect of Scooping or Scavenging. Squeegee pressure: Need to set squeeze pressure in such way that the squeegee scrapes the stencil clean with as low pressure as possible.The recommended pressure 1 -2 kg/100 mm squeegee length for metal squeegees type. Print speed: The finer the pitch, the slower the print speed; not slower, however, than what is needed to make the paste rolling. The print speed must not be so high that the solder paste is unable to roll. Recommended speed for trailing edge metal Squeeze is 0.5 to 6.0 in/sec (12.7 to 152 mm/sec) and for poly blades, 1 to 6 in/sec (25.4 to 152 mm/sec) is recommended but these parameters are paste dependents need to check manufacturer specifications. Squeegee angle: The squeegee angle is dependent on machine type and squeegee type. Diamond-shaped squeegee gives 45 degrees. The flat and knife-shaped squeegee can vary between 45 and 60 degrees, depending on machine type. 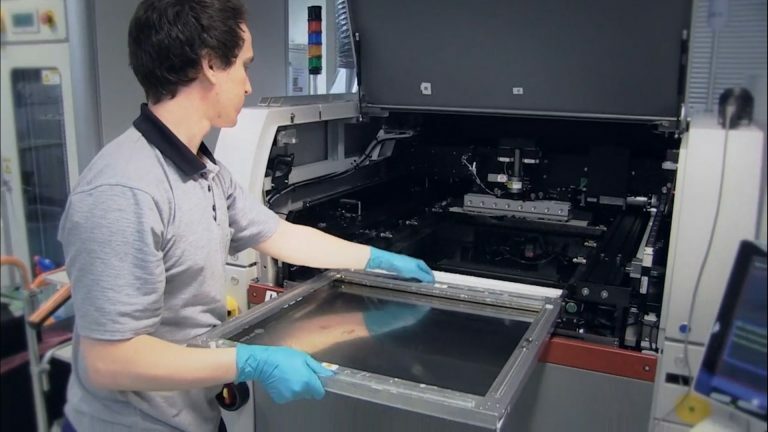 For good solder paste printing, it is required to maintain adequate environmental conditions as per given below and needs to record and monitor on a regular basis on the shop floor. Temperature: Maintain the operating temperature condition of the paste, typically between 70 and 76 F (21 – 25C). Operating outside of these settings may cause slumping or excessive drying out of the paste. All solder pastes are hygroscopic and attract moisture, which may cause solder ball problems in the reflow process. Humidity in the room will also affect component oxidation and moisture in the boards. Keep the humidity as stable as possible. Air Flow: Keep air flow in the print area to a minimum. Increased air flow will drive off the volatiles in the paste resulting in poor printing and reflow. Cleanliness: It is important to keep the printer clean. Solder paste buildup in the work nest or other moving areas will decrease the effectiveness of the board support and the repeatability of the machine. To achieve smooth and robust solder paste printing result PCB Should have good rigidity, minimal routing, and minimal warpage. Fiducials located on Breakaways of panelized boards may decrease accuracy. If the aperture is not reduced, bridging and need for wiping will be increased. Surface treatment: Solder pads shall be treated for protection against oxidation and to get an even surface. The most common methods are Hot Air Solder Leveling (HASL) or Ni/Au plating. An uneven pad impairs the fitting between the stencil aperture and solder pad. There will also be less solder paste on the solder pad, which may cause problems in component placing and solderability. When soldering circuits with a pitch less than 0.65 mm, the Ni/Au plating recommended because of its better flatness. Solder mask: The PCB is supplied with solder mask to isolate conducting parts of the board from each other. Openings in the lacquer are made for holes, solder pads, etc. The matching between the artwork on the board and the openings in the insulating lacquer is important. Bow and Twist: To facilitate the proper fixing of PCBs during solder paste printing, it must not be too twisted. Screen-printing of boards that are not flat gives a very poor result. Normally, screen printers can handle a warpage of 1.0-3.0 mm, depending on the type of fixture and the shape of the board. it is observed that a small and thick board is difficult to fix as compared to a large and thin board. For optimum printing process, the stencil frame and the PCB must be firmly fixed during the printing sequence. The board may be fixed by means of a vacuum fixture or mechanical holders and supports. Proper support there are various options are available like Vacuum Hold Down, Side Snugging of Board, Dedicated Fixture, Gel Flex etc. Proper support and hold down of the board is a must for accurate printing. PCB support units prevent the board from moving and bowing while printing. Please be caution that above board clamps, vacuum, side snugging may give printing issues, considering your product board design that needs to validates before ordering. Different pastes and processes may require different cleaning frequencies. Best results are achieved using an automatic under stencil wiper system, with both solvent and vacuum capability and an oscillating movement. The wiper cycle should be adjusted so that the underside of the stencil is kept free from flux and paste residues. Start with default settings for a single Dry Wipe. If aperture clogging and Opens are an issue, use Vacuum Wiping option to remove paste from apertures. If the stencil is not clean, use of solvent or additional wipes may be necessary. Use the vision system to verify the cleanliness of the stencil. Optimum wiper speed allows faster cycle time and saves of wiper paper. Automatic Solder Paste Inspection (SPI) may be used for measuring height, volume, and registration. In 2D inspection checks the area of solder paste deposit and in 3D the volume of deposited solder paste measured. Verification is helpful to keep a process in control and reduce solderability related defects. Checkpoints to ensure critical components to Inspect.it also helpful to Study trends to improve your process and Determine when Stencil Cleaning is necessary.